Yuji Hiratsuka was born 1954 in Osaka, Japan. He was first educated in art at Osaka Ichiritsu Kogei High School (Osaka Municipal High School of Art & Industry) and then at Tokyo Gakugei University (Tokyo Teachers’ University). After receiving a B.S. in Art Education from the University in 1978, Hiratsuka taught art at several high and junior high schools in Osaka. In 1985 he moved to the United States to pursue graduate degrees in printmaking at New Mexico State University (M.A.) and at Indiana University (M.F.A.). 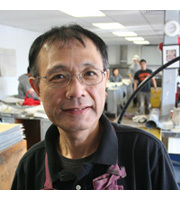 Since 1987 Hiratsuka has been teaching printmaking and drawing at several universities. He currently serves as a Professor of printmaking at Oregon State University, Corvallis. Hiratsuka’s graphic work has been exhibited in the Americas, Europe and Asia. He has received numerous awards in international competitions including most recently the Equal Prize at Majdanek 2000, VI International Art Triennial, Lublin, Poland. During the last four years he has had 14 solo shows in the United States, and international solo shows in Gabrovo, Bulgaria, Munich, Germany and Geneva, Switzerland. Combining the techniques of intaglio, relief, and chine collé, Hiratsuka creates images from the ancient and the contemporary to express the mismatched unification and hodgepodge which can be seen in daily life. His chine collé prints on Japanese washi paper express the whimsical and spontaneous aspects of human nature. Hiratsuka’s imagery bears a resemblance to traditional Japanese Ukiyo-e prints, but also expresses contemporary aspects of the Western Hemisphere. Hiratsuka’s work is included in many public collections including: The British Museum, UK; Tokyo Central Museum, Japan; Panstwowe Museum, Poland; The House of Humor and Satire, Bulgaria; Cincinnati Art Museum, OH; Jundt Art Museum, WA and The Portland Art Museum, OR.